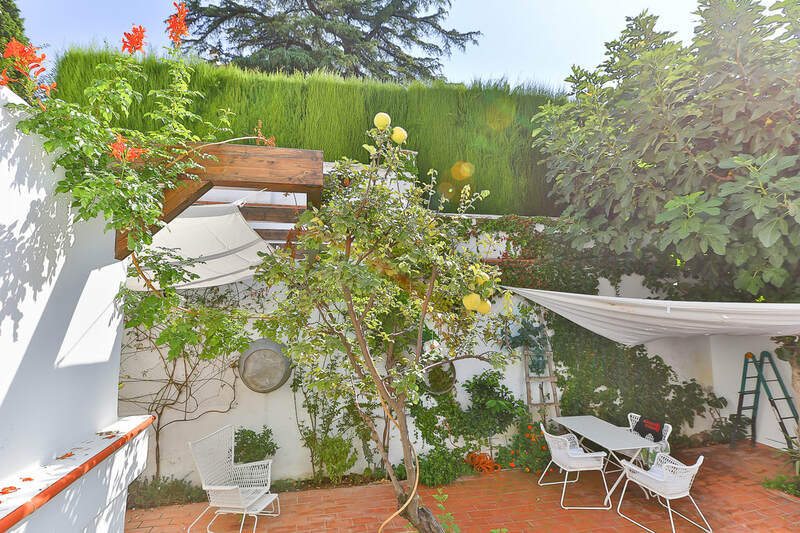 This 4 bedroom house in the Albaicin has a stunning large patio. It is located in a small quiet square walking distance to shops, Mirador the San Nicolas and schools. The house is fully furnished and equipped with all necessary appliances, including heating. Enough bedrooms and bathrooms for a large family or for a small family and guests. There is a private parking spot in front of the house. The house lays on two floors: The ground floor has one double bedroom (double bed), bathroom, a large living space and kitchen (no dish washer) , dining room and lounge with sofa and a small TV. There is direct access to the internal planted courtyard. There is separate bedroom and bathroom off the courtyard . On the First floor the master bedroom, attached to a study , has a private access to a roof terrace with Alhambra/Sierra Nevada views. There is another bedroom on this level, a lounge area and a bathroom. The two main bedrooms have A/C. There is central heating and a washing machine. €1,250 per month plus bills.